If James Cameron gets his way, Mars could be getting thePandora treatment when NASA launches its newest rover Curiosity on an ambitiousmission to the red planet next year. The famed "Avatar" director, whose own 3-Dcamerawork has revolutionized the cinematic industry, has convinced NASA to mounta 3-D camera on top of Curiosity's mast for the upcoming Martianmission, scheduled to launch in 2011. Cameron believes that including a camera with 3-Dcapabilities will help engage the public and generate more excitement aboutCuriosity's work. "It's a very ambitious mission. It's a very excitingmission," Cameron said according to the Pasadena Star-News. "(Thescientists are) going to answer a lot of really important questions about theprevious and potential future habitability on Mars." Cameron spoke in a Tuesday event at the California Instituteof Technology (Caltech), which is near NASA's Jet Propulsion Laboratory (JPL)in Pasadena where the Curiosity rover is being built. Cameron lobbied the space agency to include the 3-D cameraon Curiosity's mission after JPL scaled back plans for such a device in 2007,as a way to compensate for the $2.3 billion mission being consistently overbudget and behind schedule. 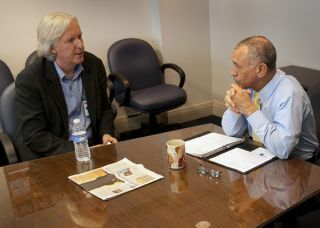 In January, Cameronmet NASA chief Charles Bolden and was able to convince him and the spaceagency to purchase a 3-D camera for Curiosity,the director said. It would replace the mast camera (without 3-D capabilities)that has already been built and was delivered to JPL this month. While the Curiosity team is unsure whether the new camerawill be ready in time, they are eagerly anticipating the camera's potential torecord Martian movies at a rate of 10 frames per second, reported theStar-News. "You could take a movie and image clouds moving in thesky or a dust devil moving," said Joy Crisp, JPL deputy project scientiston Mars Science Laboratory, the official name for the rover project. "Asyou're driving, you could take a movie." Now, it will be up to the Malin Space Science Systems, theSan Diego-based company charged with building several of Curiosity's cameras,to scramble to buildthe 3-D camera in time. "It's a thrill to be on even a tiny part of the mission,"Cameron told the Star-News. Cameron also spoke about the Earthly inspirations used tocreate the fictional world of Pandora, the moon location of his mega-hit "Avatar." The filmmaker revealed that Pandora was created to look exoticand foreign, while still maintaining elements that audiences could identify andrelate to. "We tried to make it not completely fanciful,"Cameron told the audience at the event titled "Is PandoraPossible?" "If it was too outlandish, there would be abelievability gap." To achieve this, Cameron took cues from flora, fauna andvarious other phenomena on Earth to create Pandora,which was conceived as a moon in the Alpha Centauri system.